Ashlea in Barnard Castle, County Durham sleeps 4 people. Ashlea in Barnard Castle is set within the grounds of the owner’s farm; Ashlea is the perfect location for guests wanting to explore the local area. Surrounded by fields and open countryside, with great views over towards Eggleston, Middleton and County Durham, this detached cottage is a peaceful and restful hideaway, yet only a short drive away from major transport links. With weekly and monthly farmers markets, plenty of places to eat and drink and a variety of shops, galleries and antiques stores, there really is something to offer for all tastes. Guests who enjoy a spot of history will enjoy a visit to the ruins of Barnard Castle and the ever changing exhibits at the popular Bowes Museum. This is an ideal location for guests who enjoy walking, cycling or rambling, Ashlea is very well situated for a day walking in the Durham Dales and the North Pennines. There is a public footpath that crosses through the fields behind the cottage, along the Deepdale River and then on to Barnard Castle. For more serious walkers and cyclists, guests can take a trip to Hamsterley Forest, which consist of 2000 acres of open woodland. There is the themed Gruffalo Trail for children to enjoy and also a play area for younger guests, as well as numerous picnic tables for a leisurely lunch in the great outdoors. A little further afield but still within an easy drive a trip out in the Durham Dales and the North Pennines Area of Outstanding Natural Beauty is a must, here you can explore the magnificent landscape and natural attractions, including High Force and Low Force waterfalls. Enjoy pony trekking in the area, fishing in the lakes and rivers, exploring the nature trails, sailing, canoeing, water skiing, mountain biking and golf, all located within an easy hour’s drive from Ashlea. Ashlea has been lovingly renovated to offer a comfortable and cosy destination for you to enjoy, relax and unwind. Surrounded by fields and open countryside, the scenery and views are ever changing and can be enjoyed from all angles. 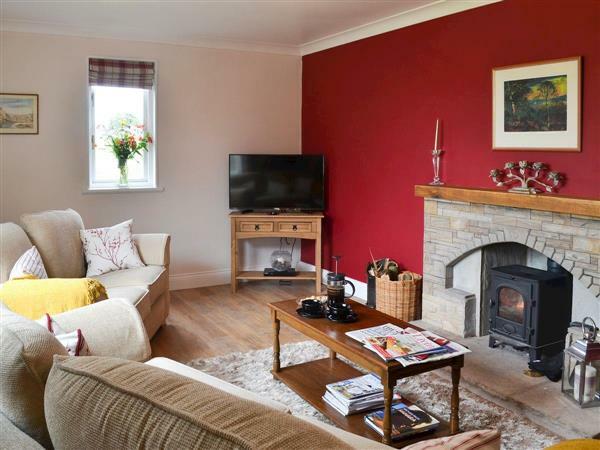 All on one level, guests will find a well presented living room with a wood burner and wooden floor. The kitchen and dining room are open plan and offer contemporary, good quality fixtures, fittings and appliances, as well as a great view from the kitchen sink! There is a lovely conservatory which looks out onto the garden, and is a great spot to sit in and enjoy the peace and quiet of the surroundings. The property offers a double bedroom, a twin bedroom and a family bathroom with a double shower cubicle and heated towel rail. Well maintained, presented and furnished throughout, guests will find Ashlea a real home from home. The shop, pub and restaurant are 2 miles from Ashlea in Barnard Castle. Ashlea in Barnard Castle is all on the ground floor. Living room: With wood burner, 42 Freeview TV, Blu-ray/DVD player and wooden floor. Kitchen/dining room: With electric cooker, microwave, fridge, freezer, dishwasher, washing machine, tumble dryer and wooden floor. Oil central heating, electricity, bed linen, towels and Wi-Fi included. Initial logs for wood burner included. Travel cot available on request. Welcome pack. Enclosed garden with patio, garden furniture and barbecue. Bike store. Private parking for 2 cars. No smoking. Please note: There is a fenced stream in the garden, 110 yards away. Holidays at Ashlea run from Friday to Friday. For a better idea of where Ashlea is, you can see Ashlea on the map below. Ashlea is in Durham; should you be on the lookout for a special offer, you can find all the special offers in Durham. It's always worth checking to see what is on offer at the moment. Do you want to holiday near Ashlea (UKC2346), you can see other cottages within 25 miles of Ashlea; have a look to find your perfect holiday location.